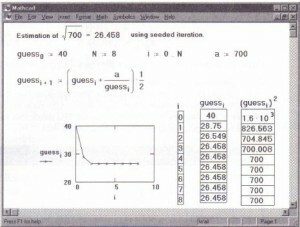 Seeded iteration is a recursive technique for solving difference equations such as those that arise in compound interest problems, Markov processes, and many state variable equations. 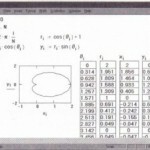 It can also be used for obtaining approximate solutions for certain differential equations. In a seeded iteration, you specify the first element of an array and then compute successive elements based on the first element. This section describes three types of seeded iteration: iterating a single variable, iterating multiple variables, and iterating a vector. • To find Ja, begin with a guess value. Continue until the guesses converge to an answer. Using seeded iteration to estimate a square root. • Each is defined in terms of a previously computed element. It is this dependence of array elements on previously computed array elements that distinguishes seeded iteration from the more straightforward iteration discussed in the previous section. 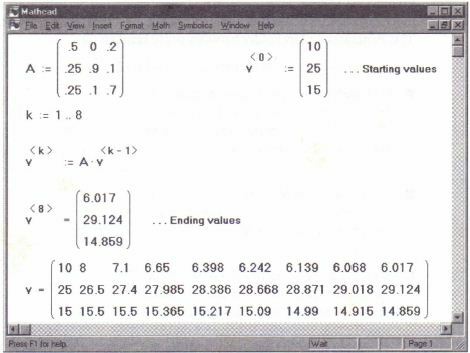 You can use Mathcad’s vector notation to iterate several variables simultaneously. This variation on simple seeded iteration is a powerful method for solving a system of simultaneous difference equations. 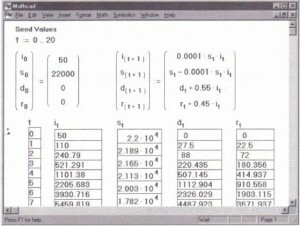 When you iterate several variables, each step computes the value of the variables from all of their previous values. You can’t accomplish this with several equations because when Mathcad sees an equation with range variables, it attempts to evaluate it for each value of the range variable before going on to the next equation. You must, therefore, create one equation that performs all the iterations simultaneously. 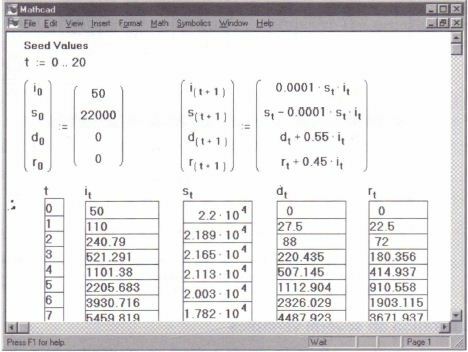 shows how to perform a simultaneous iteration using these equations. The single most important thing about this example is that all the t + 1 subscripts are on the left-hand side of the matrix equation. 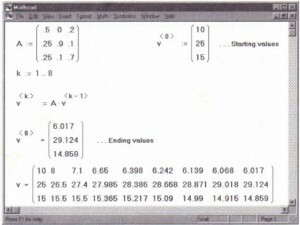 The right-hand side contains only the subscript t. Mathcad evaluates all the expressions on the right-hand side before performing any assignments to the left-hand side. This means that nothing on the right hand side can depend on something on the left-hand side. Simultaneous iteration to model an infection. You can also perform seeded iteration starting with a vector and computing a new vector each time. This type of iteration uses a seed vector and Mathcad’s superscript operator. Figure 11-12 shows how to set up a Markov process. 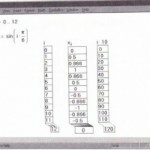 This technique uses superscripts to index an entire column of a matrix at once. To create a superscript, press [Ctrl]6. 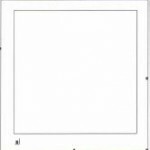 This generates a placeholder between angle brackets: < >. • Click to the right of the matrix and type v. Then press [Ctrl]6. Type in the placeholder for the superscript.